In the last Wingeom tutorial, we have learned about the Midline theorem and how to use the basic tools of Wingeom such as the point and segment. In this tutorial, we are going to construct an equilateral triangle by mimicking compass and straightedge construction. In doing the construction, we will learn how to use the circle tool, and how to delete (or strictly speaking, hide) objects. Double click the Wingeom icon to open the Wingeom window. If the tip window appears, click the Close button. Top open the drawing window, click the Window menu and then click 2-dim or press the F2 key on your keyboard. When the drawing window appears, click the Maximize button. 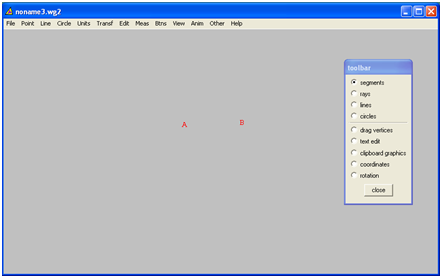 To display the Wingeom drawing tools, click the Btns menu, then click Toolbar. First, we will construct two points which will be the centers of our circle. To construct the two points, select the segments option button on the toolbar, then right click two distinct places in the drawing window. Notice that letters A and B appear in your drawing window. Figure 1 – The Drawing Window and the Wingeom Toolbar.